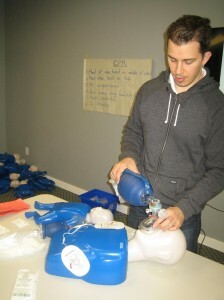 Toronto First Aid delivers a number of cardiopulmonary resuscitation “only” courses. By far the most detailed cardiopulmonary resuscitation training course available from this workplace approved provider and offered by Toronto First Aid is CPR “C” for health care providers (also known as CPR “HCP”). This program teaches students a number of CPR and AED procedures for victims of any age. Individuals will understand how to use advanced devices and skilled support. Components such as checking pulse, two rescuer CPR and the use of bag-valve masks are included in this program. This course is designed for individuals who work in or plan to be employed in the health care field. AED training and certification is provided in this class. Sign up is easy and Toronto First Aid has the most competitive prices on health care provider cardiopulmonary resuscitation programs in Toronto. We believe that a good class is created with a great teaching environment with knowledgeable, experienced and patient instructors. All of our certified instructors are the best workplace approved first aid and CPR teachers in Toronto. Search down to the base of this page to sign-up for the health care provider cardiopulmonary resuscitation course that meets your schedule. This CPR course is featured a few times per week at a variety of dates and locations in Toronto. Payments may be paid for your class via a number of methods including debit, credit or cash. You can either come to one of our training locations or you can book a private course. All of our training centres are conveniently located throughout Toronto with easy and quick access to public transit and with available parking nearby. Almost all participants finish the program without trouble. As soon as students finish the program they will receive a St Mark James card that satisfies several employment, government and academic requirements. This certificate includes AED accreditation. The certificate comes in the size of a wallet sized card. This CPR lesson normally takes about five hrs to complete. Students will learn the way to handle a number of cardiopulmonary resuscitation (CPR) complications and receive a basic intro to cardiovascular emergency situations. Students will learn how to perform two person CPR. Application for the training course costs Sixty dollars. Within the fee is accreditation fees and St Mark James instruction guide. Private cardiopulmonary resuscitation (CPR) lessons are offered in Toronto via this provider. A private CPR HCP course can be booked at almost any time at our training locations or we can have an instructor come to you. Get in touch through telephone or electronic mail to book a class. You can also use our “contact us” page and fill out the form to receive a quote or to have any of your questions answered. Health care provider CPR (CPR HCP) re-certification programs are featured at Toronto First Aid. Go to the cardiopulmonary resuscitation HCP and AED renewal page to learn more regarding specifications and registration for CPR HCP refresher classes. Select a class featured below to sign-up for your CPR “HCP” class today. Learn about advanced CPR and AED abilities and techniques in Toronto through Toronto First Aid.